By this point pretty much everyone knows that smart phones collect data and send it back to their manufacturers. Apple and Google collect user data every day, and they are reasonably upfront about it. However, you would be surprised to know just how often your smart phone touches base with the mothership, so to speak. A recent study conducted by faculty at Vanderbilt University analyzed how often phones send data to manufacturers every hour. It actually differs based on whether you are using Android or Apple. Apple users would be pleasantly surprised to hear that their iPhones send data to Apple far less frequently than Android phones send data back to Google. For iPhones the per hour rate while your phone is idle is four, with it going up to eighteen times per hour during periods of heavy use. Android phones leave this statistic far behind, sending data to Google a whopping forty times during idle periods and ninety times during periods of heavy use. 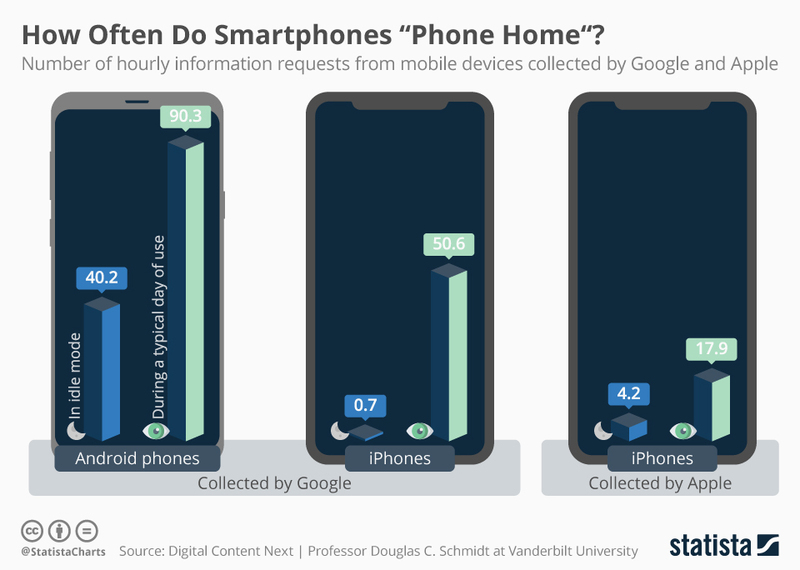 These are all averages of course, the rate of sending data can go up and down due to a number of factors, but the fact of the matter is that Google is definitely keeping a close eye on how you use your phones. Also Read: Which Smartphone Emits The Most And Least Radiation — Samsung, iPhone, Google Pixel, Xiaomi, or Huawei? In a way, it makes sense that Google would be receiving data far more frequently than Apple. After all, Google has a lot more uses for this data due to their various tech interests which are often outside of Apple’s range of interests. Still, the number is quite high, and one can wonder what kind of data Google is receiving exactly, and what the tech giant intends to do with said data.